When I have updated to wordpress3.8, error code such as the following was displayed. Redirection plug-in did not correspond only to “wordpress ver3.7.1” at the moment when I checked on the official website. 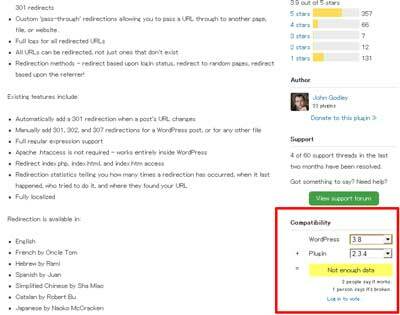 But, in place at the bottom right of the plug-in page(please refer to the image below), there is a review of voting version of the plug-in and wordpress. There is also a combination of a site “wordpress ver3.8” is no problem, it could not be determined Redirection whether the cause of the error. By looking for the contents of the error, did not have a little information. However, you can “hide” the error that you write the following in the CSS of the theme file. As a result, the error is no longer out to clear all cache, if you re-install the latest version of the Redirection plug-in. Compatibility before you updated the “wordpress ver3.8” and “Redirection” might went wrong.